OldMaps.com Antique Map Price Record includes the most up-to-date information on the antique maps market. The database currently contains over 200,000 entries, representing thousands of mapmakers. This data was compiled from the offerings in thousands of dealer and auction catalogs beginning in 1982. New listings are routinely added as they become available. While the Antique Map Price Record provides an extensive survey of the market, it is not a complete record of all sales. The database is meant instead to provide you with a broad sample of the market and adequate information from which to determine the general value of a map. If a specific map is not found, studying comparable items from the same period, cartographer or geographical region will assist in determining an approximate value. This database is compiled from various published sources and indexed into a standardized format. The powerful search engine provides a quick and efficient method to locate and compare entries from several different indexes. There are a number of variations in the way antique maps are cataloged. The database has normalized these where possible. However, the following salient points will assist you in locating a specific or comparable entry. Some maps have more than one title. Titles may appear in a cartouche, above the map, or may be repeated in another language. The same map may have a different title depending on the language of the edition in which it was published. In many cases, a dealer may have paraphrased or abbreviated the title. Wherever possible the title is given verbatim with the exact spelling and punctuation. It is customary to omit unnecessary parts of very long titles, but there is not a standardized format for such omissions. Maps without a title appear in the database with the word Untitled, generally followed by a descriptive title enclosed in square brackets [ ]. Diacritical characters such as umlauts and accents are omitted to facilitate computer searches. This designation is somewhat arbitrary as it may include several different people involved in the creation of a map. This can include the surveyor, draughtsman, engraver, printer, and/or publisher. There is no consistent standard for assigning one of these people as the map-maker. For instance, many U. S. government maps include the names of the surveyor, draughtman, and expedition commander. Therefore, you may find the same map listed under three or four different cartographers. Where two cartographers or publishers are known to have worked together, or took-over publication from one another, they will listed together, e.g., Mercator/Hondius. There are several dates that can be associated with a specific map. These can include the date the map first appeared, date printed on the map, copyright date, published date or range, and circa date. There again, there is not a standard within the community and you should expect to see some variation between entries. The database contains dates in the format provided in the source catalog. There are inherent inconsistencies in the assignment of subject and geographical region. For instance, a map covering the Northern Pacific Ocean and including both coastlines of Asia and North America might be cataloged under the subject of Alaska because it depicts an early version in the mapping of the region. Another dealer might designate it as a map of the Pacific, and still another might catalog it under North America. Wherever, possible the editors have grouped similar maps in the same category. Dimensions are provided in both inches and centimeters. The measurement of maps is not consistent throughout the trade. Normally size is measured from the border or neatline of a map. However, it sometimes represents the extent of the platemark, or even the paper size. While it should not be relied on for exactness, it is helpful in determining the identity of maps when there are several dissimilar entries with identical titles. Prices in the database represent either a dealer's listing (asking price) or an auction's hammer price including buyer's premium. Prices are shown in U.S. Dollars even though the price for which the item was offered or sold may be a foreign currency. The currency conversion rates used were 1) the date a dealer's catalog was received, or 2) the date of an auction. It must be borne in mind that the actual price for which an item sold (represented in U.S. dollars) might vary depending on currency fluctuations. The database includes only two classifications - colored and black & white. The coloring on antique maps may be described by a number of different terms; full, wash, outline, original, contemporary, later, modern, printed, chromolithograph, etc. To further confusion, there is not a standard designation used in the trade. Therefore, it was not possible in the context of this database to accurately represent these variations. There is not a standard condition classification in the antique map trade. Many dealers make a blanket statement in their catalogs that all offering are in very good condition unless noted. Still others only address condition when asked and do not mention it in the catalog. Even when included, one dealer's 'fine' might be another dealer's 'very good', making comparisons difficult. Therefore, subjective statements of condition are not included in the database. Specific descriptions of special attributes, flaws, or repairs are included when provided. If known, this information includes the name of the atlas or other publication from which a map has been extracted. It may also include the author and/or publisher's name. This is the place of publication or the city in which a cartographer was known to have worked. References are cited to direct you to a source of information that may help you to identify and/or learn more about a given map. The information includes author, title, and page or catalog number. Most references cited can be found in the list of references in the Resource Finder. While the database does not generally include the entire text of a catalog entry, any mention of a map's cartographic or historic significance is included. This section will also include mention of the map's state, imprint, edition or other specific attributes. The database includes the identification of the dealer or auction house with the catalog name/number and date of issue. 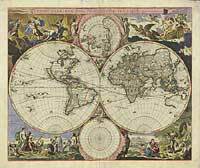 By their very nature, antique maps are scarce and the overall market is relatively small. Therefore the principals of supply and demand greatly affect price and result in sometimes wide variation in price for similar material. There are a number of factors that affect the value of a map and help to explain these variations. Collectors can acquire antique maps from a variety of sources. The Antique Map Price Record database includes information from the catalogs of both dealers and auction houses specializing in cartographic material. This information varies in the degree of comprehensiveness and accuracy. For instance, condition bears heavily on price and it is often not adequately described in catalogs. Other differences between dealers and auctions should be kept in mind when comparing prices. Dealers maintain an inventory with its associated carrying costs and overhead. Prices often vary between dealers due to location, i.e. ; a map of Paris will have a higher price from a Parisian dealer than if it were found in a shop in Chicago. A dealer's catalog listing represents an offer to sell, but does not include a potential discount or even reflect an actual sale. Dealers often provide additional services to the collector such as mounting or protective sleeves, approval periods, certification, education and a relaxed atmosphere in which to contemplate a purchase. The costs of these services are included in the price of their offerings. An auction is a competitive venue and the results may vary considerably depending on the venue location and number of buyers in attendance. While prices realized might be less than a dealer's asking price, there are also instances in which the auction price will exceed a dealer listing. The geographic region directly affects the value due to market demand. Maps of the world are of global interest and therefore are generally the most expensive maps from a given source. The market in North America is also larger than in South America and therefore demand is higher for maps depicting North America or its constituent parts. Certain geographical regions are more 'interesting' due to historical events or current popularity, i.e., The East Indies or the wine regions of France. Maps of more remote or less affluent regions tend to be less expensive. Maps that are milestones in the history of exploration and cartography will command a higher price. These include maps that are the first to depict an important event, the discovery of part of the world, or the first correct mapping of an important geographical feature. While antique maps are limited by their very nature, there are varying degrees of scarcity. Therefore, one might see a wide variation in price between two, otherwise similar, maps due to the relative scarcity. The historical importance or celebrity of a cartographer can influence price. Therefore, nearly identical maps by a famous name and a less well known cartographer may be priced differently. This can also have the opposite affect in cases where the scarcity of a cartographer's work offsets its lesser historical significance. Many maps have a surprising long publication history. For example, there were over 30 editions of Ortelius' monumental work, Theatrum Orbis Terrarum, from 1570 to 1612. During that period, the individual copper plates from which the maps were printed were revised, repaired, or in some cases, replaced. Printing plates were a significant capital investment for a publisher and were inherited or sold on the death of a publisher. Therefore, a map may be attributed to one or more cartographers, i.e., Mercator/Hondius or Sanson/Mariette. Generally an earlier state will command a higher price. However, this is not always the case when a revision includes a significant discovery or perhaps had a shorter print life. Therefore, it is important to know the significance of the various states and how that might effect value. The more beautifully engraved maps often sell for a premium due to aesthetic and artistic desirability. Generally, older maps are more valuable, given all other factors are equal. Larger maps are generally more valuable than smaller maps of the same age, style and subject matter. This is an important consideration when comparing records, as it was a common practice for mapmakers to publish the same map (with identical titles) in large and small formats. Coloring affects the value of a map in several different ways, but generally a colored example will have a higher price than an uncolored one. This is not the case when the color is poorly applied, has deteriorated or faded, or has been applied in a manner out of context with the style of the period. This is one of the most important and subjective factors in pricing. Minor flaws that are relatively insignificant or can easily be repaired will have a minimal effect on value. On the other hand, serious problems including irregular tears, loss of image and unsightly stains will greatly affect the desirability and price. Condition is always more important when a piece is relatively common, and less significant if the map is rare. Unfortunately, there is not a standard method of describing condition within the market. It is also common practice not to provide a detailed condition statement in catalogs. When available, the database includes specific condition descriptions. However, subjective statements such as good or fine have not been included. - The editor and publisher declines any responsibility for uses made of this database. The prices indicated may in no way be considered as professional appraisals and are intended to provide an indication of the approximate market value. Every effort has been made to ensure the accuracy of information. However, typographical errors, as well as other errors, may be present in the database. We disclaim responsibility for any consequences of such errors.